All my favorite people are weirdos. Our daughter is overflowing with this magical, neverending waterfall of creative ideas. 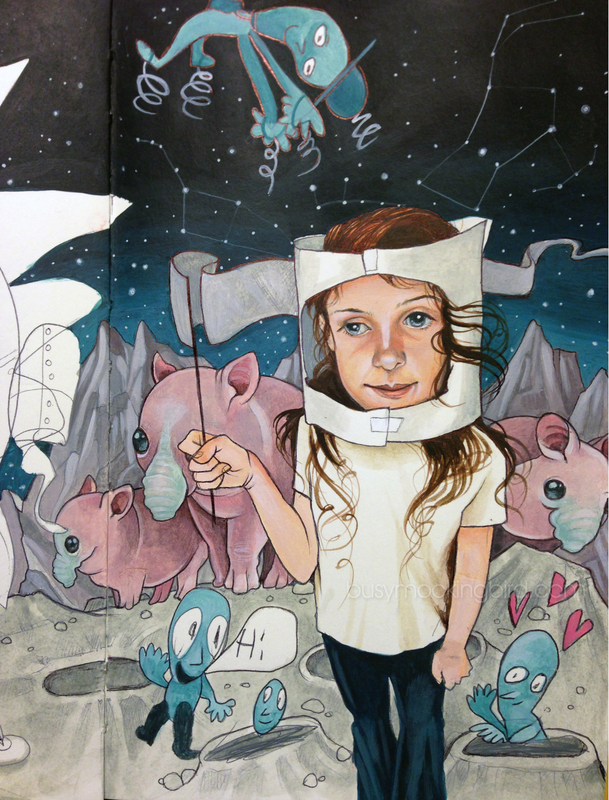 She grabs paper and tape and makes shoes, or helmets, or tails, or spaceships, or her own paper zoo, complete with three-dimensional animals. Her wheels are always turning, and as a person who constantly tries to keep up with all the creative ideas in my OWN head, it’s so amazing to witness and recognize in someone else. 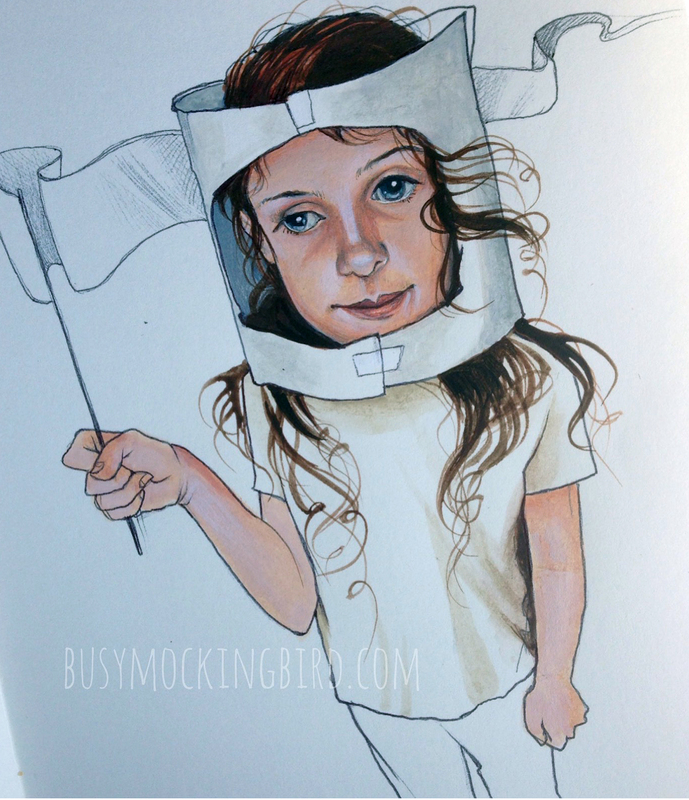 The other day, I drew a little picture of her with a paper space helmet she made. 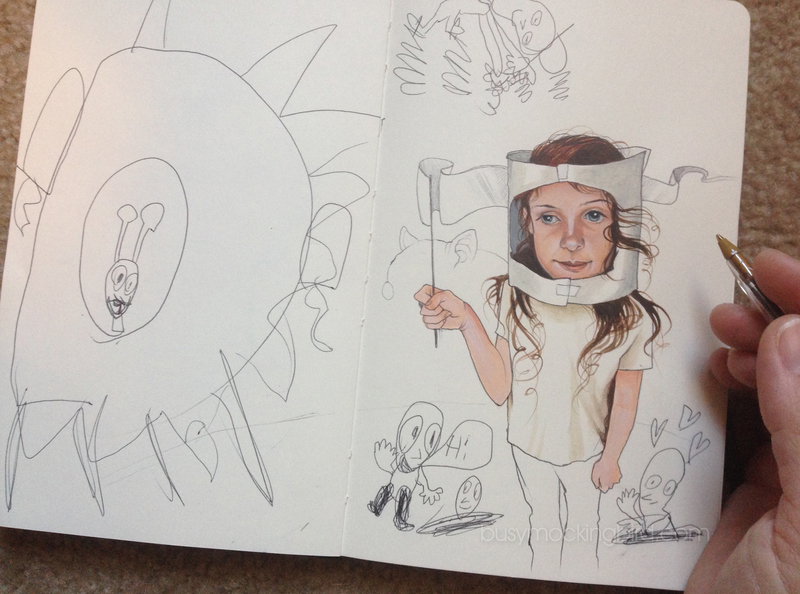 She had made a paper space helmet for me too, and we took turns exploring a new planet in our living room. Later, she added aliens in it, and told a little story about them. That she had come to a new planet. That there were aliens that looked like babies but that were adults. They were blue. 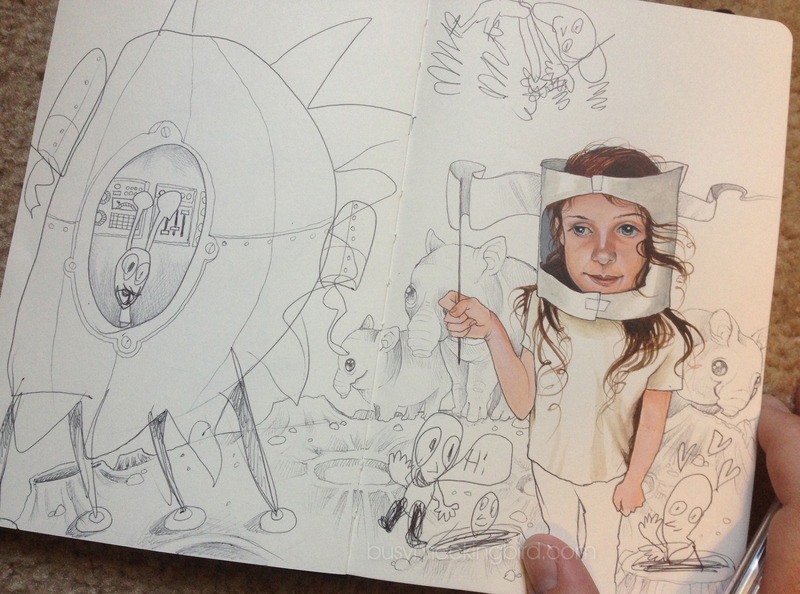 One was in a spaceship, one was in love with her, and one said hi, as another peeked out of a crater. Another showed off his invention of springy shoes and hands. We talked about what I could add, and later I showed her my doodle, which instantly brought an “AWWW!” when she saw the cute little big-eyed mouse-elephant-tapir-alien things in the background. She gave me color suggestions, and asked me to please make sure I added a little light blue to the alien critters in the background. Listen, I get it…she likes weird things. She likes bug and bats and dinosaurs and Batman. She has a wild imagination and loves to pretend. She knows about sci-fi, and I do my best to answer any question she might possibly have about ANYTHING, and try to explain it to her in a way she can easily understand. Nothing is taboo (and believe me, she ASKS). People are most likely going to call her a weirdo. I’ve been expecting it, because I went through it myself firsthand. 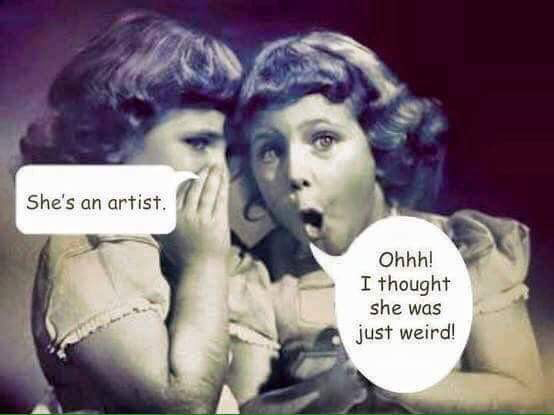 So I’ve made it a mission to point out to her that the most creative people around her, the most wonderful people, the most artistic friends we have, have ALL been called “weird” at some point or another. One day at the playground, inspired by “Secret of the Kells” (in which there was a girl character who was a shape-changing wolf-girl), she ran around to the other kids, saying “would you like to play werewolves with me?” The kids looked at her strangely. I’m sure their idea of “werewolf” was more the scary halloween type, and not the cute shape-shifting fairy girl-type. I started to worry that she’d get discouraged and feel bad, but I let her handle it. Cut to ten minutes later, though, and nearly EVERY KID on that playground was playing werewolves with her. She had them all going in a den (under the slide) to rest, and then coming back out into the “trees” (the monkeybars) to run around in the wild, meet with the other wolf packs, and chase prey. She wasn’t bossy or domineering. She just helped them find their inner weirdos. Hopefully, this girl’s gonna be just fine. I looked at the drawing we did again, and I realized I had drawn her holding a little banner flag,which made me think of when people say they’re letting their freak flag fly, which seems totally appropriate. Let your weirdo flag fly! So I told her times might get rough sometimes, and people will try to hurt your feelings for being different, or make you feel bad, but you keep doing what you love doing, and you might even change someone else for the better. And so far–thank GOODNESS–she’s gotten the message: she’s a weirdo. And so am I. 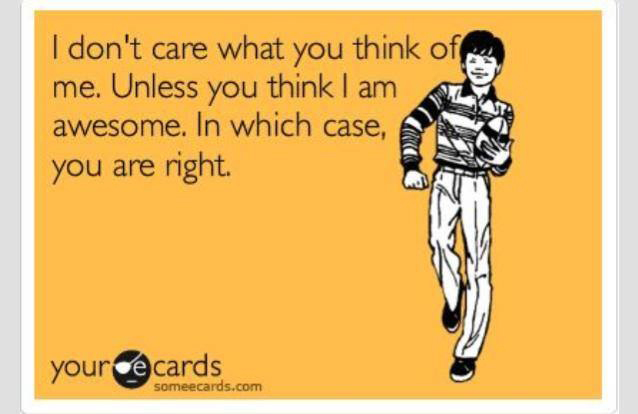 And maybe so are you. And you know what? That’s AWESOME. Because all the best people are. Totally needed this today. Thank you! Reading this post made my heart sing. It is great that you are so positive and nurturing of your daughter’s weirdness. You are doing wonders for her self-esteem. I am a weirdo and my husband is a weirdo and it was, therefore, inevitable that our kids would be weirdos. 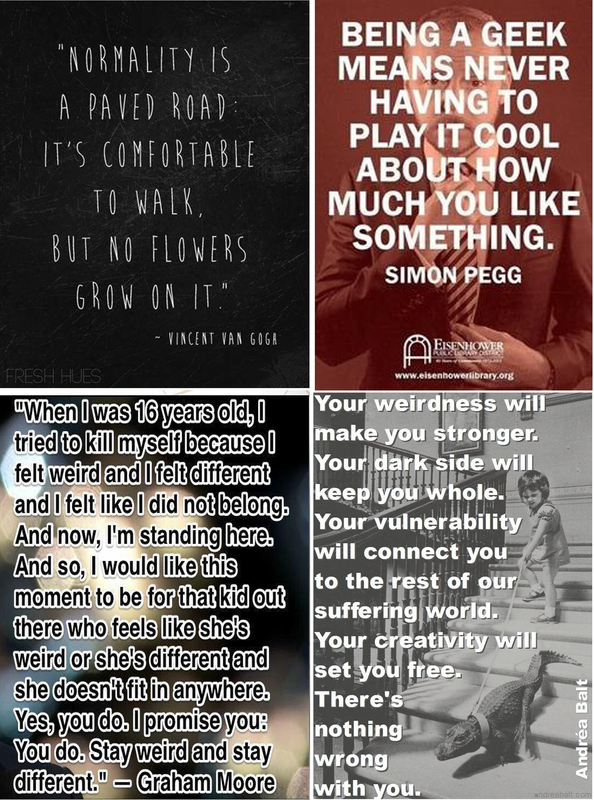 We have always worked hard to celebrate their quirks and differences, the things that make them individuals, the things that bring them joy because we recognised that at some stage they were going to experience some flak or lack of understanding from others. It was very easy to manage when we lived in a tiny town in Scotland but moving to the suburbs of a major American city my kids have started to experience being made to feel their difference, have heard people call them weird and mean it in a bad way rather than a cool way. 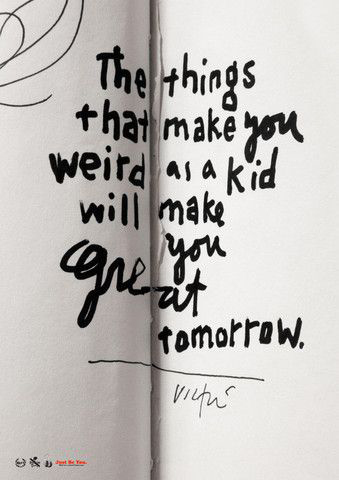 When my now 8 year old was being bullied, one of the things the kids would often call him was “weird”. The exclusion of that upset him but the word did not. All that investment paid off because my kids are OK with being weird (so far anyway) and being non-conformists. While their friends think they are weird for knowing about classic monster movies and knowing all about mythological creatures, for playing outer space zombies or animal secret agents, my kids think they are weirdos for being obsessed with sports statistics and playing baseball. Celebrating difference and diversity is what it is all about. Being true to yourself is what it is all about. As I often tell my kids, wouldn’t life be so entirely boring if we were all the same? Finally, your anecdote about playing werewolves reminds me of a picture book my kids have on this very subject. I wonder if you now it? It is called “I’m Special; I’m Me” by Ann Meek. I so enjoyed your blog today. Thank you for making me feel real good. We are a family full of rather idiosyncratic people too, and I’m SO thankful that we were lucky enough to land in a K-8th school that encourages individuality. I do worry that my kids’ highschool experience will be traumatic, but I hope my kids and I will rise to the occasion like you and Myla do. I remember being deeply hurt when someone called me weird when I was younger. And then, as I grew up, something wonderful happened… I met other weirdos and boy, did we have fun together! OMG have I told you lately how much I love you!! Well I am now. 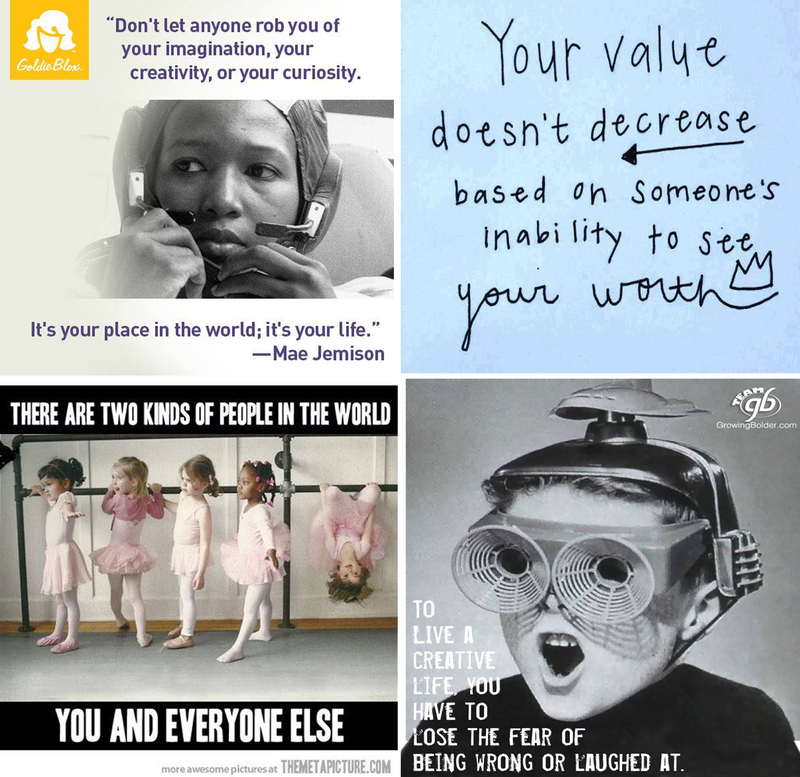 I love your posts, your take on Motherhood, the way you encourage your daughter the way you are both completely and awesomely yourselves and the message you are passing on to her to stay true to who she is and they way she’s being a light in her world. I am in awe and you are both AWESOME. You’re welcome. Love this post, and you and Myla! Thank you! Ha ha, what a wonderful story. How cleverly your daughter deals with things! I raise my metaphorical hat to you both.